He, therefore, is a wise and prudent man, who, after morning prayer, spends an hour renewing his own spiritual reckoning, and says, "My soul, you only have one life; no moment that has passed can be recovered, and in God’s mind the number of your breaths has been set down and cannot be increased. When life is done, no spiritual highways will hold the traffic of your freighted soul, therefore what you would do, you must do now; so treat this day as if your life were spent, and this, an extra day, was granted you by special favor of Almighty God. What folly greater than to lose this chance?" 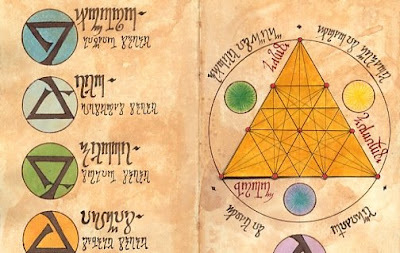 The Alchemy of Happiness (Kimiya'e al Saadat) by one of the most celebrated muslim mystic of all time, Imam Al Ghazzali, is considered a timeless spiritual masterpiece. It is an abridgment of Ghazzali's magnus opus, his famous Arabic treatise on mystical Islam, The Revival of the Religious Sciences (Ihya Ulum al-Din). It is often considered as a manual for finding happiness in life and joining with God after death. In this work, the master mystic details advice for seekers and traveler of the Way for attaining of the goal which he calls "spiritual happiness." 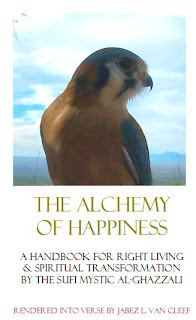 In the Alchemy, Ghazzali has provided the seekers with a critique of faith and a detailed guidebook for the pure ecstasy of the loving Divine Presence: absolute spiritual happiness. In the spirit of restoring the oral tradition, contemporary poet and author Jabez L. Van Cleef has done a wonderful contribution to the genre of religious literature for our time by producing the complete book, 'The Alchemy of Happiness' into an audio book or podcast. In his production, Jabez L. Van Cleef has interpreted the text in iambic pentameter verse with occasional mix of tunes. His lucid voice brings out an ethereal quality of this already mystical text in such a way that it penetrates the heart of the listener. A text like this by no mean an easy read for all and an opportunity to listen to it reconfirms the power of oral tradition, an universal approach appreciated and emphasized in all world faith / spiritual traditions. [>] You can download complete book or individual chapters as mp3 / podcast. Visit GarageBand page for The Alchemy of Happiness. About | Jabez L. Van Cleef is a poet and author of more than twenty books on religious and human rights themes. His writing provides a spiritual basis for informed sustainable living. All of his books are available free as sound files and text on the Podcast section of iTunes. Following are few of his major works: Verse Interpretations of the Christian Gospels include: The Song of John, The Song of Luke, The Song of Matthew, The Song of Mark, and The Saxon Gospel. Verse Interpretations of Other Sacred Texts include The Book of Ashes (Hebrew), The Song of Judith (Hebrew), The Alchemy of Happiness (Muslim), The Tawasin (Muslim), Nanai & The Quest for the Fire Bird (Siberian), He Kumulipo (Hawaiian), Igbo Singing (West African), The Song of Confucius (Chinese), All Is Beautiful: The Navajo Creation Story (Native American), The Unstruck Drum of Eternity (Poetry of Kabir), and God Wears Many Skins (Sami Myth and Folklore). These podcasts are freely available via Jabez L. Van Cleef's website: Sustain Your Spirit.